AMSTERDAM-NOIR Afpersers & Gijzelnemers Trump’ & Bolden steken Keizer Xi tijdens G-20 diner een mes in de rug met ‘arrestatie’ CEO Wanzhou van Huawei(Video). 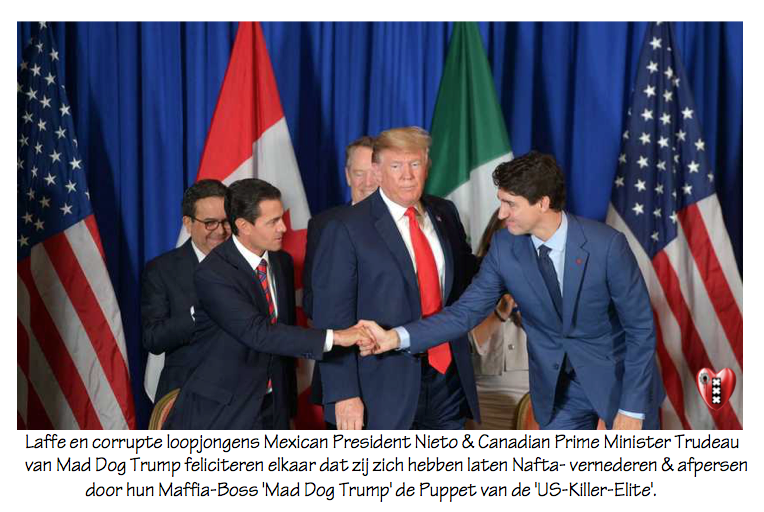 Bending to the will of ‘Crazy War-Mongul-Washington’, de laffe ‘Mooi-Boy-Canadian PM Trudeau’ the Puppet from ‘Mad Dog Trump’ is on a collision course with Beijing following the arrest of a senior Huawei executive in December. What sort of madness motivated Trudeau to make such a decision?Canadian Prime Minister Justin Trudeau, 47, is famous for his good looks and quick smile, but unfortunately being photogenic does not guarantee political instincts, which he seems to be sorely lacking.Last February, for example, during a visit to India, Trudeau’s cabinet sent a formal dinner invitation to Jaspal Atwal, an attempted murderer from a Sikh organization that India ranks as a terrorist group. Although the invite was eventually rescinded, it certainly made a lasting impression on his Indian counterpart, Narendra Modi.On another cringe-worthy occasion, the self-proclaimed “proud feminist” interrupted a young woman at a political event for using the term “mankind,” explaining pedantically that the correct nomenclature was “peoplekind.” This may have been the first town hall meeting in history where airsickness bags were needed.It’s this sort of insufferable desire-to-please-everyone phoniness that helps explain why Canada’s most powerful Liberal is suffering precipitous drops on the popularity front. And now Justin Trudeau has managed to outdo even Justin Trudeau. 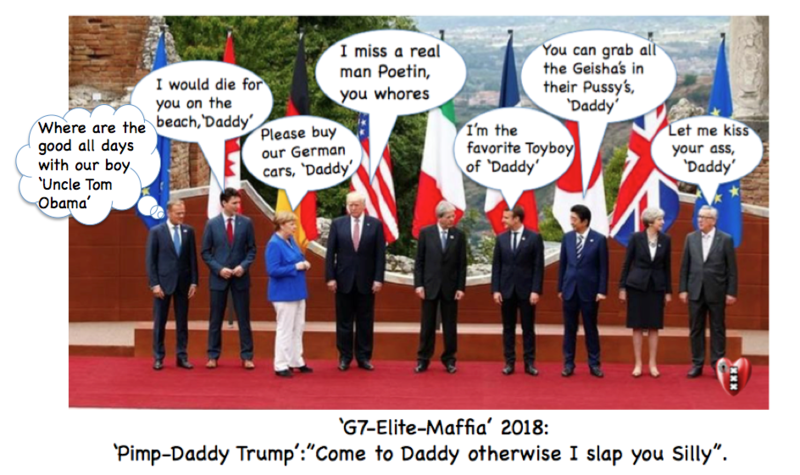 # G7 2018: Laffe Canadese premier Trudea doet flink nadat ‘Daddy-Trump’ zijn hielen heeft gelicht. In early December, amid a major blow-up between the US and China over tariffs, Trudeau’s government arrested Meng Wanzhou, the chief financial officer of the Chinese tech giant Huawei. Meng is not your typical office worker. She is the daughter of Ren Zhengfei, the founder and CEO of Huawei. Needless to say, the officious Chinese took tremendous offense at her incarceration, which has since been ‘upgraded’ to house-arrest status as she awaits extradition to God’s Country.Trudeau seems to have underestimated the consequences of offending a nation of over one billion people, who just happen to make up Canada’s largest export market. Yet he went ahead anyways to appease the ‘Mad Dog-Trump administration’, which requested Meng’s arrest and extradition purportedly on the grounds that her company violated a ‘US-Killer-Elite -sanction- regime’ against Iran. Here, Trudeau would have been wise to tell Washington he would not risk a major international scandal – and especially one that would have no small impact on Canada – over the arrest of one person. Here’s where things get funny in a gallows humor sort of way. Although the United States certainly played no small role in Meng’s arrest, not a single American has been accosted, molested or arrested by China in the wake of the high-profile scandal. That pleasure has been reserved for Canadian citizens living abroad, specifically in China.Just days after Canadian authorities in Vancouver arrested Meng, China security agents apprehended Michael Kovrig, a former diplomat now living in Hong Kong, and Michael Spavor, a businessman. Beijing would only say the two Canadian nationals were being investigated for carrying out activities “harmful to the national security” of China. But that seems like small fries compared to the possible fate that hangs over their compatriot, Robert Lloyd Schellenberg, who has been sitting in a Chinese prison since 2014 for drug smuggling. In December 2018 he was sentenced to 15 years in prison. Now, just weeks after Meng’s arrest, the case was reopened by Chinese prosecutors who called the original verdict “too lenient.” At the new trial, Schellenberg was found guilty and handed a death sentence.Trudeau, who does not strike me as a chess player, expressed his “extreme concern” at the decision, which really should have come as no surprise. The Schellenberg case was clearly a show trial to give Beijing some leverage in freeing Meng Wanzhou, and now it will be very interesting to see how Trudeau responds. 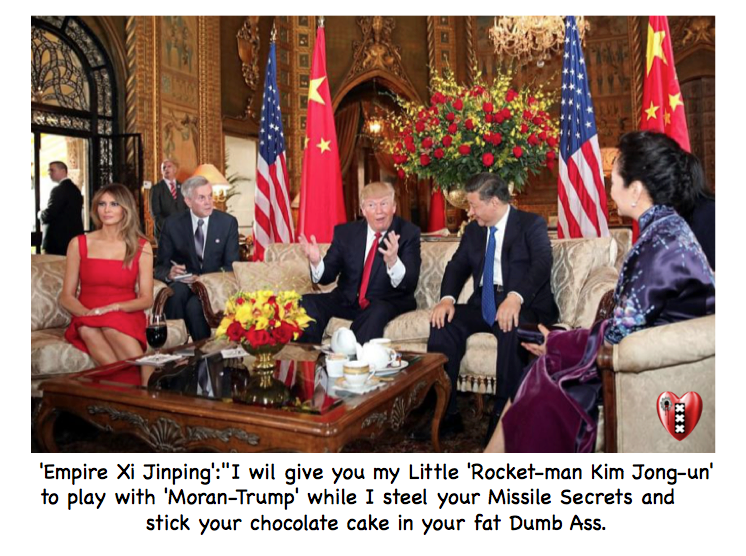 Will he cave in to US demands and extradite Meng, or will he hold onto the Chinese national in a possible exchange agreement for the three Canadians? 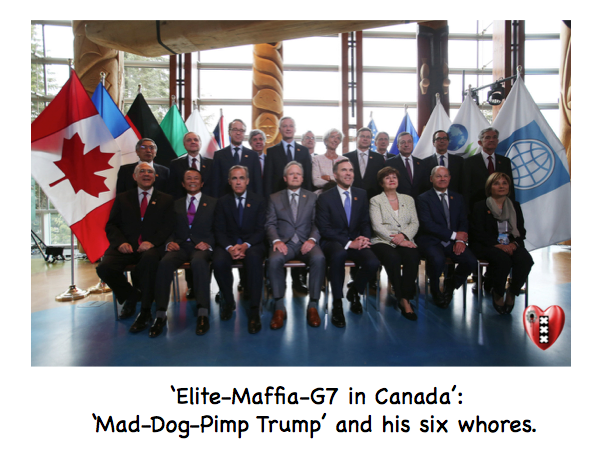 The Canadian prime minister has proven his credentials as a second-rate politician in that he allowed himself to be placed in check no matter where he moves. On the one hand, if he decides to return Meng to Beijing in a swap deal, he will be condemned both at home and abroad for “going weak” on China. Trudeau’s vanity and ego will likely prevent him from taking such action. On the other hand, should he extradite Meng to the US, aside from showing disdain for three jailed Canadian citizens, he would set into motion a major diplomatic fallout with Beijing that would have far-reaching implications on the political and economic front for many years. 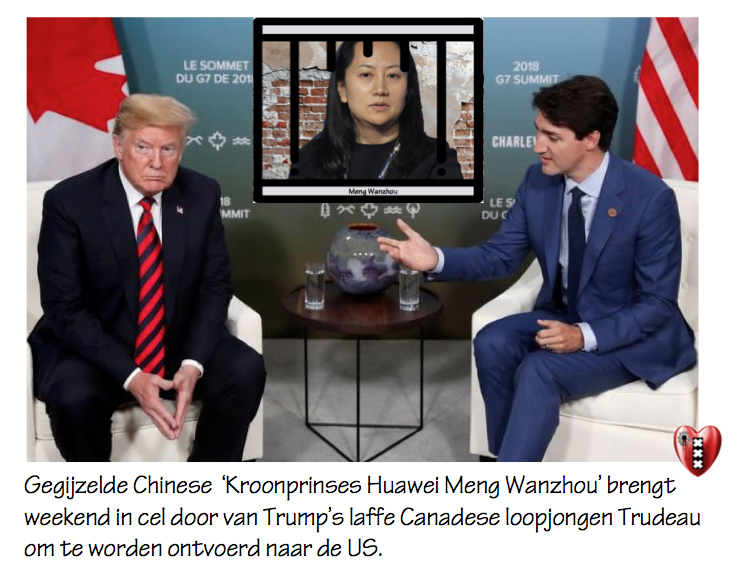 At this point, the question is: why did the ‘US-Killer-Elite’ demand Meng’s arrest from Canada, a move that prompted Trudeau to commit a major political blunder? Initially, I was convinced the reason was solely based on Washington’s desire to rally its allies to inflict yet more economic pain on Tehran, suffering as it is under a ‘US-Killer-Elite- sanctions- regime’.However, there is another consideration at play that greatly overshadows Washington’s strange obsession with Iran, and that is the huge strides that China has made in the development of 5G communication networks. This technology, and despite health concernsregarding its usage, seems destined to be the backbone for the much-hyped ‘Internet of things’ where practically every single electronic appliance – from toasters to automobiles – will be monitored by the all-encompassing matrix.Huawei, thanks to massive investment by the Chinese government, is a global pioneer with regards to 5G, and now many Western countries fear China’s dominance in this field presents a real security threat. After all, only the Western governments should be allowed to spy on their own citizens. 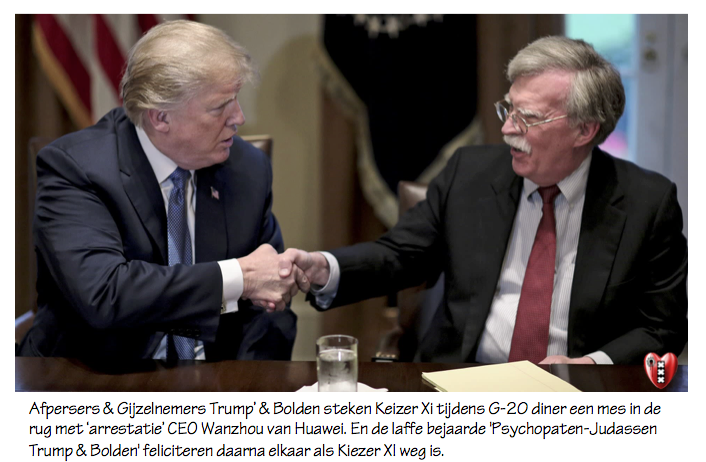 Psycho-Bolton’ Unveils Plan to ‘Counter’ Russia and China to Dominate Africa(Video) just like the EU, Saoedi Arabië and the Oekraïne,etc. 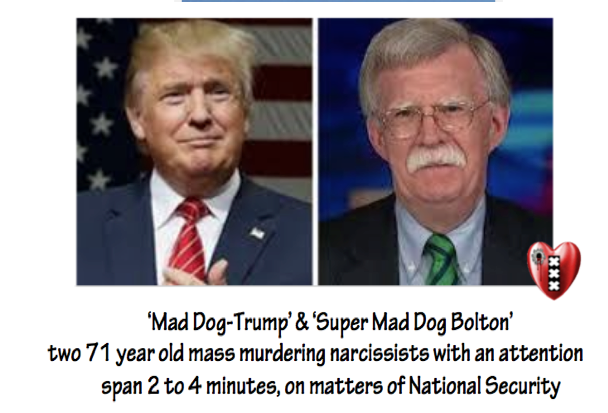 National Security Adviser ‘Psycho- John Bolton’ . Well, did he? Bolton says he knew of Huawei exec’s arrest ‘in advance,’ contradicts own spokesman .All jokes aside, a reportby Deloitte shows how far China leads the world in this technology. “Since 2015, China outspent the United States by approximately $24 billion in wireless communications infrastructure and built 350,000 new sites, while the United States built fewer than 30,000. Looking forward, China’s five-year economic plan specifies $400 billion in 5G-related investment. Consequently, China and other countries may be creating a 5G tsunami, making it near impossible to catch up.”China, meanwhile, in an effort to stem the panic, has said there are ways of safeguarding the communication grid to make it impervious to spying. Those assurances, however, have done little to console Western countries over the alleged risks in allowing their 5G networks to be Chinese built. Germany, for example, is now debating whether to follow the ‘US-Killer-Elite’ lead and restrict Huawei from accessing its next-generation cellular networks on national-security grounds.Whatever the case may be, Justin Trudeau allowed himself, as well as Canadian citizens, to be played as a pawn in a high-stakes game between the Washington and Beijing. He should have remained a neutral observer to the fireworks, which would have given him far more room for political maneuvering as the debate over 5G (and Iran) promises to continue. Now Justin Trudeau is stuck between a rock and a hard place, between his ego and his vanity, and his prospects look grim indeed. venezuela raak je alles kwijt niet alleen de eilanden maar ook holland die zwart was en jullie holbewoners hebben het wit gemaakt geboerders de witt waren zwarte mannen ! Die amerika die jou vader en zijn despoten de zelfde methode hebben gebruik om Hitler aan de macht te brengen in Duitsland hebben jullie gedaan in amerika zwarten onderdrukken wat je weer doe en om te zeggen wij zijn goed jullie neus in ieders mans zaken te stoppen en denken we dansen met de duivel dus we zijn sterk ? Wat jullie willen is de olie, steen,goud van venezuela en het was niet venezuela maar groot colombia dus de eilanden zijn ook van groot colombia niet van jou en dan stuur je de flikker rutte die als je zeg spring dan spring hij, je tijd zit er op alles wat je op papier zet maak niks uit de realiteit is, je tijd is op begin je voedsel banken in holland op te ruimen. Hij wil niet eens terug komen om zijn kinder pardon op te ruimen in zijn eigen nederland laat staan wat anders en de surinames lul naad van de rug die je macht heb gezet op curacao kan alleen maar zijn dood verwachten van de met de junkie als gouverneur wout pas op je ben op de verkeerde weg beland hoor ! Via ceta krijgen we er de producten van mosanto op ons bord?